For many years physicians have counseled patients with gout about their diet. Gout is a very painful form of arthritis that is caused by excessive amounts of uric acid in the body. These deposits of uric acid tend to accumulate in joints and occasionally lead to an explosive, dramatic flare-up of joint pain, usually in a foot or ankle, with severe tenderness, swelling and redness. The typical patient with gout is male, overweight and according to folklore, consumes too much alcohol and, rich foods. In truth, the elevated levels of uric acid in the bloodstream are caused by a variety of factors, not the least of which is a genetic predisposition leading to a kidney defect that interferes with elimination of uric acid in the urine. 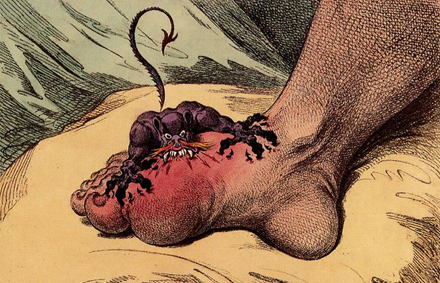 We know that gout patients have a higher incidence of other medical problems. They tend to be overweight and have high blood pressure and elevated cholesterol levels. Gout patients are more likely to be diabetic, have impaired kidney function and suffer from heart disease. Many experts have wondered whether the elevated blood levels of uric acid seen in gout sufferers is at the root of these other medical problems. Recent reports indicate that a special diet, known as the DASH Diet, recommended for patients with elevated blood pressure, also may lower uric acid. DASH stands for “Dietary Approaches to Stop Hypertension.” The diet is simple, specifying an increase in fruits, vegetables and low-fat dairy foods and a decrease in red meat, sweets, cholesterol and trans fats. In a small study it was found that patients with a uric acid elevation of >7(mg/dL) had an average reduction of 1.3mg/dl following the DASH Diet. How significant is that finding? How does it compare to the effects of medication? These are the questions experienced gout patients and their doctors need to answer. Gout “diets” that are usually recommended involve avoidance of shellfish, organ meats and fatty foods but the best of these diets typically lower the uric acid level by only 1 point. The DASH diet is a little better than that, but most doctors experienced in treating gout attempt to lower the uric acid well below 6. For my patients, I target a value of 5 or less. Clearly the DASH diet will not accomplish that in patients with uric acid values of 8 or 10, the levels we typically see in the blood of patients with untreated gout. So diet is usually not the best method to reduce a gout patient’s uric acid deposits. Medications are much more effective in accomplishing this goal. Diet may help, but not enough. Although weight reduction should always be encouraged for overweight patients with gout, I don’t believe the DASH Diet or other “gout diets” will provide sufficient uric acid lowering in patients with severe gout. There are effective medications that accomplish this goal much better. Therefore, my usual advice is: Try to lose weight, avoid alcohol, and take your uric-acid-lowering medication consistently.